The Porsche 550 Spyder that is believed to be the only Porsche 550 Spyder to enter a Grand Prix, was hammered at right in the middle of the estimated price fork. No surprise at all, with a history as the this one. We are wondering if the car will come into a collection where it will be stalled, or will it be used in race events. We hope to see the car back at least at the Porsche Rennsport Reunion VI later this year, at the Laguna Seca Raceway. We were surprised to see that the Porsche 993 Carrera RS 3.8, which is a rare bird, remained unsold, with a highest bid of $330.000. Maybe the car found a buyer after the auction. More rare Porsches that remained unsold at the Bonhams Auction in Scottsdale were the the 1956 Porsche 356 Carrrera GS Coupe and the 1953 Porsche 356 Pre A Cabriolet. We did not see the cars with our own eyes, so we cannot judge. Was there something wrong with the cars or the provenance of them? We don’t know but we had expected to see these cars go to another home. However with a highest bid of respectively $580.000 for the 1956 Porsche 356 Carrrera GS Coupe and $170.000 for the 1953 Porsche 356 Pre A Cabriolet, the hammer price was somewhat higher. 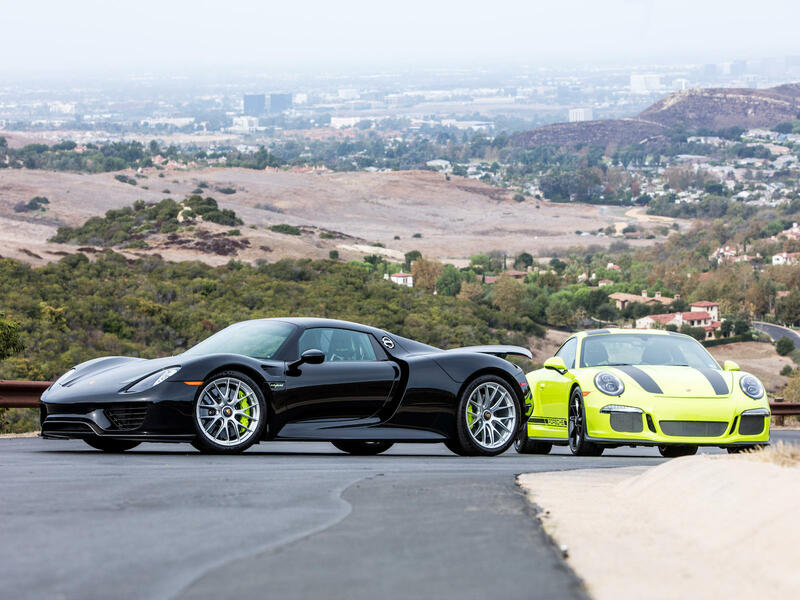 The ultimate pair of Porsches : the Porsche 918 Spyder and the 2016 Porsche 911 R with matching serial numbers found a new home and we are wondering if these cars will spend their days in the same collection.